NoseDial App Is A Seasonal Must-Have | OhGizmo! Announcing Our Last Minute Holiday Giveaway Winner! Why spend money on special gloves, a stylus or voice-activated Bluetooth gear in order to use your iPhone in the cold when there’s another available appendage for operating the touchscreen sitting right between your eyes? 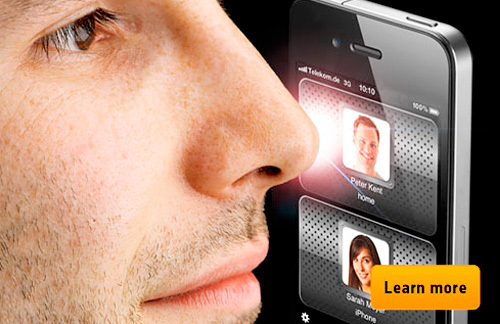 This German NoseDial app displays your list of contacts as a set of large buttons, making it easy for you to place a call by simply hitting the screen with your nose. The list can be scrolled by tilting your iPhone too so you don’t need to slide your nose across the display, and the app is available from the iTunes App Store now for just $0.99. ← Announcing Our Last Minute Holiday Giveaway Winner! Give a whole new meaning to the phrase “hunt & peck”! Would be frustrating if you're like me who always has a runny nose when it's cold outside!!! GROSS!